Key Personnel Gary Whild, who had a extensive career in the non league as a player with Moor Green and Stratford Town has been at the helm since March 2014 and had been the Number two under previous “gaffers” Steve Burr and Andy Thorn. He has managed at Redditch United. Leave M5 at junction 4 (signposted A491 Stourbridge). After approximately 5 miles, turn left onto A456 and follow towards Kidderminster. At roundabout on Kidderminster Ring Road, take first exit (signposted A451 Stourport). At next roundabout, take first exit (signposted A448 Bromsgrove), then take first turning on right (Hoo Road).Aggborough Stadium is approximately half a mile along on the left hand side. These directions are courtesy of KHFC. Kidderminster Station is only half a mile away from the stadium and you can smell the legendary Aggborough Soup in the air. Car Parking is available at either end of the stadium, at the South Stand Car Park and Stadium Close Car Park (£5.00 per car, £10.00 per mini bus and £15 per coach). The supporters coach will leave the Hive at 10am with earlier pick up points at Potters Bar Station, Barnet (3 separate places), Whetstone and Edgware starting at 9am. The price is £27.00 return. The fayre inside Aggy was renown as some of the best in the country at this level in the past. Home made pies and gravy were a must as was the Cottage pie, which I do hope is still presented. What I can confirm is the legendary home made Aggborough soup is still available. The Harriers Arms can be found next to the stadium where visiting fans are permitted in small numbers. The Railway Bell, next to the station is a great bet for a pie and a pint while the King and Castle (inside the station) is a gem for real ales and ciders. 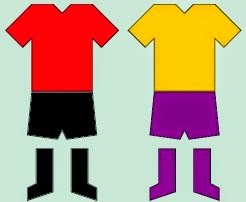 The ground, which has been in existence since 1890, was the first in the country to host a floodlit FA Cup match, when on 14 September 1955 Harriers played Brierley Hill Alliance in a preliminary round replay, which Harriers won 4-2. £17.00 for adults, £11.00 for Over 60s and Under 16s, whilst children under the age of eight are admitted FREE. Our last visit to Aggborough was in March 2014 losing 1-0. 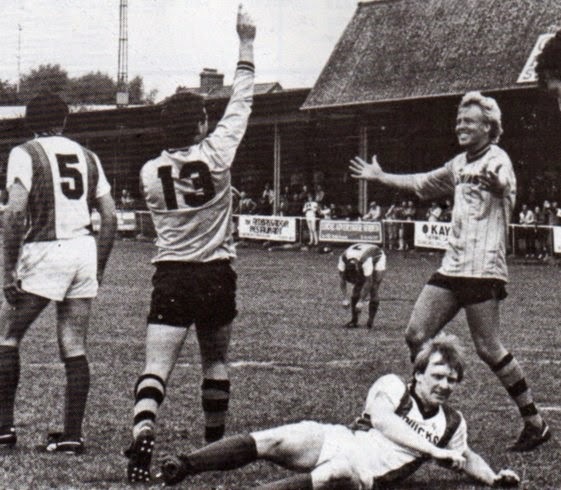 One of the great Barnet games of the 1980's was a 4-4 draw with Kiddy in April 1984 with two goals each coming from Steve Mahoney and Stewart Atkins. Two months earlier we beat them in a very physical game (on and off the pitch) at Underhill 2-1 in the FA Trophy (Atkins and Steve Ragan). 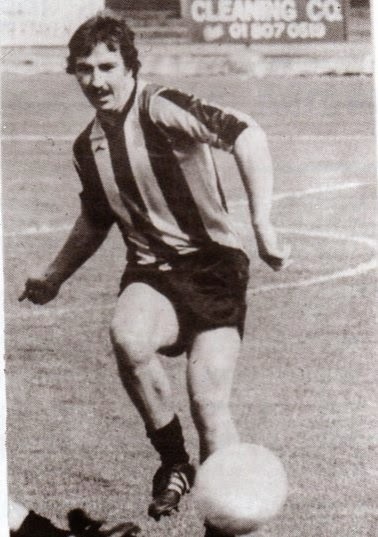 The following season the Bees put another 4 goals away at Aggborough and that man again Steve Mahoney scored a hatrick. 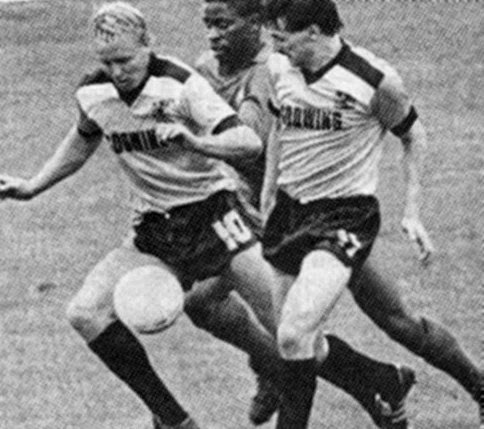 In 1986 Barnet scored five at Underhill courtesy of David Sansom (2), Nicky Evans (2) and Edwin Stein. Oh yeah some serious A list dudes have been spotted in and around Kidderminster over the years it seems a very popular stop off place. Bamber Gascoigne from University Challenge is your starter for 10 while Robert Plant of Led Zeppelin, Jeff Lynne of the Move and ELO and Tony Iommi of Black Sabbath would certainly fill the Hive Bar if they got together! Chris Tarrant was spotted buying a Lottery Ticket in the Stourbridge Road recently. I would like to thank everybody for putting up with my ramblings for another season and I am afraid they will be back next season. I also hope these guides have been of some help. I have made the odd error I admit and for those you have my sincere apologies. Reckless.